After hearing all the great reviews and about ParkZone T-28 Trojan , I couldn't resist buying one for my self. Boy was I blown away by just how powerful this little gal is. She has just as much pep as some of my glow powered airplanes, not to mention a heck of a lot cheaper. I actually paid less for this fully ready to fly airplane including radio system, motor, ESC, than I have paid for some of my four stroke engines alone! When I picked it up I planned on putting it together that night and flying it the next day. To my surprise, it only took about 15 minutes to assemble. I ended up flying it the same day I picked it up! 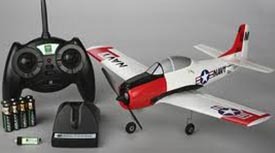 Unlike my glow planes, the ParkZone T-28 Trojan is made with Z-Foam. It's a very strong, lightweight, durable material that resembles Styrofoam but is much easier to repair. It has a very shiny surface that really makes it look sharp. You've probably noticed the ParkZone T-28D to the right has a completely different color scheme as mine. The only difference between the original and the "D" version is the color scheme. Wondering what the "D" actually stands for? The U.S. Air force began using North American T-28A's as a military trainer in 1949, replacing the T-6 Texans. The T-28B became the T-28C when it was equipped with arresting gear for landing on aircraft carriers. In the early 1960's, the wings were modified to mount weapons and the T-28D became the armed version of the Trojan. In a nut shell, the "D" designates the latest version of the Full-scale Trojan that carries fire power! Buying either the BNF or PNP ParkZone T-28 is a good investment as the following components can be used with future airplanes. If you add the cost of each component you will see that the ParkZone T-28 really is a heck of a deal. She comes with the powerful factory installed 480 brushless outrunner motor. No need for time consuming and confusing programming of the ESC. 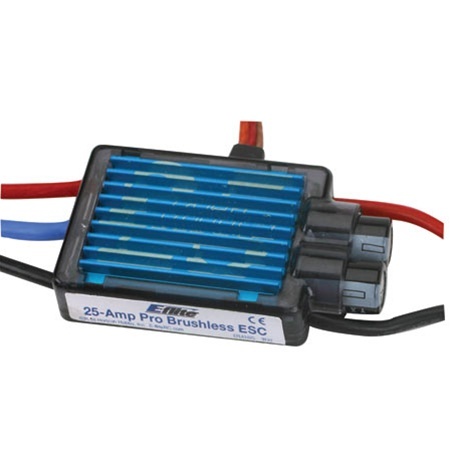 All you need to do is simply plug the motor into the pre-programmed 25-AMP electric speed controller and your ready to go. 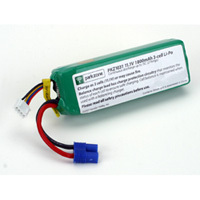 The 11.1V, 1800mAh Li-Po battery provides a high level of power and performance! If you're flying aggressively, this bird averages around 6 to 7 minutes per flight. If you lay off the throttle for an easy and relaxing flight you can expect to get around 8 to 9 minutes. This plane comes with a balancing charger that greatly extends the life and performance of the Li-Po battery pack by making sure each cell is charged equally. Li-Po batteries have the potential to be dangerous if changed incorrectly. This charger was designed with the beginner in mind as it takes all the guess work out of the procedure. 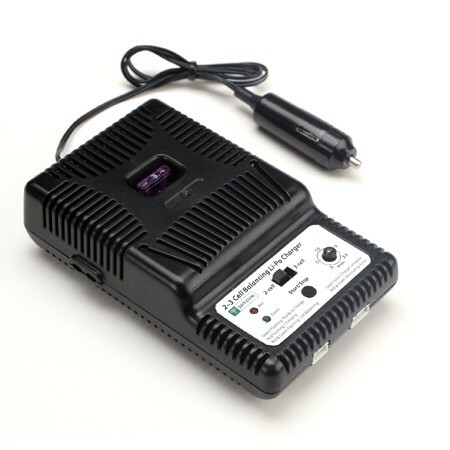 This charger plugs directly into the cigarette lighter of your car so you can recharge as many times as you'd like while in the field. Is This the Right Plane for You? If you're new to the hobby and have someone to help you with your first couple of flights, this plane should be on the top of your list when choosing your first plane. It comes with everything you need, which is very convenient and cost effective for a beginner. It's extremely stable and very easy to fly. 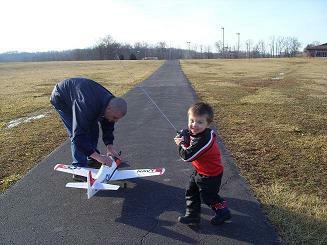 This is one of the rare RC planes that is fun for all pilots, regardless of experience. I have been flying for years, and this airplane is now one of my favorites simply because it's hassle free to fly and it performs! Three year olds are smarter than you think! Since I already owned a Spektrum DX6i radio, I opted for the Bind N Fly (BNF) version which comes with a Spektrum AR600 DSMX 6-channel receiver already installed. If you already have a transmitter that's DSMX compatible, no problem. Just pick up the PNP version that comes with everything except for the receiver. 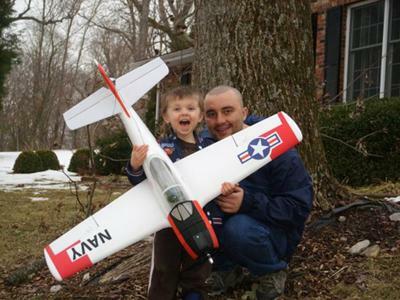 If you don't have much room to fly, you should take a look at the Ultra Micro Parkzone T-28. I have one of these as well and it's almost scary just how similar the two behave in the air. You can fly this little guy just about anywhere. It never hurts to check eBays listings below as you may stumble upon an awesome deal.